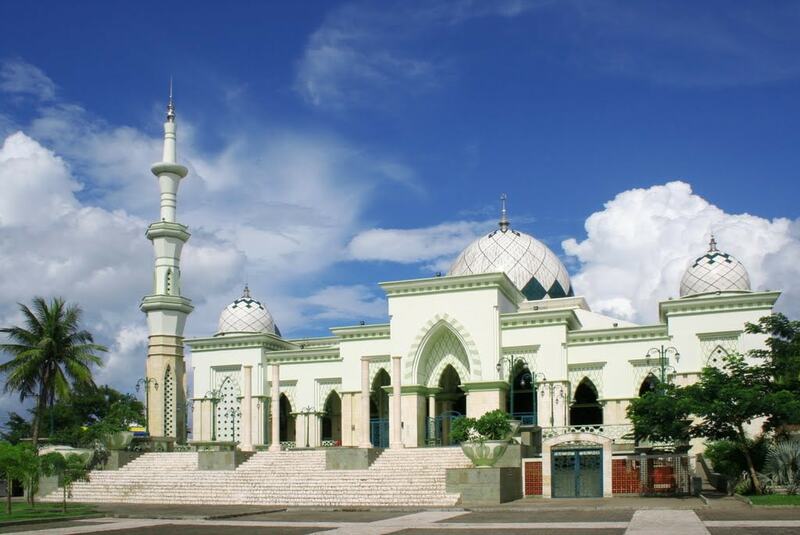 As the largest Muslim population in the world, Indonesia has some of the biggest and most majestic mosques. More than simply aesthetically beautiful, some of these mosques also have cultural and historical significance, which are reflected in the contemplative architecture. 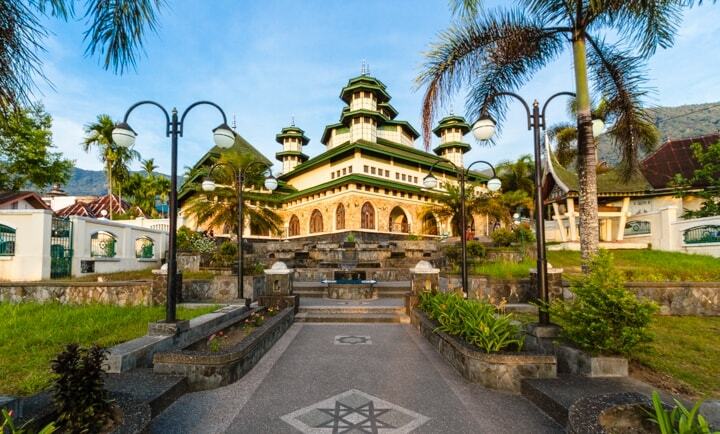 From oriental style to futuristic design, discover the most beautiful mosques in Indonesia. 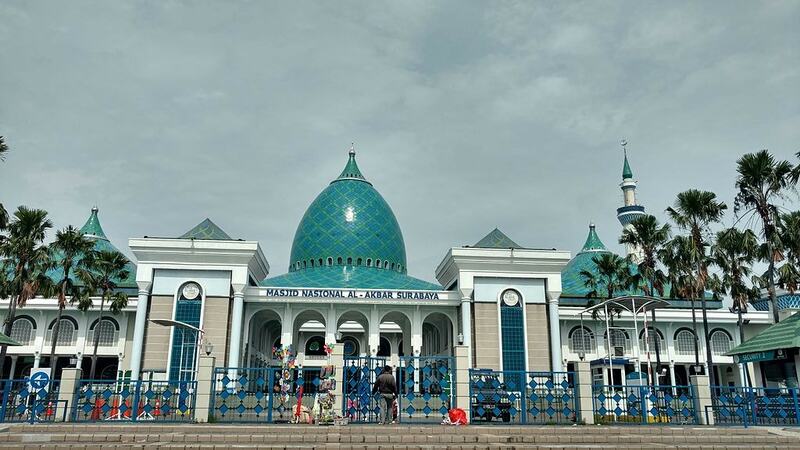 Located in the heart of the sharia-governed Aceh Province, this mosque survived the devastating tsunami in 2004, sheltering thousands of evacuee within its sturdy structure. After renovation work, it was reopened in 2017, retaining its original design with grand domes and a classy monochromatic façade. During its first construction in 1879, materials like marble staircase, windows, and building stones were sourced from China, Belgium, and the Netherlands. The mosque’s new face features hydraulic umbrella-shaped towers and a new pond in its front yard. This grand mosque is perhaps one of the most important landmarks in Indonesia and certainly the biggest mosque in Southeast Asia. Built as a manifestation of gratitude for the nation’s independence, its grand architecture is dense with cultural and historical symbols, such as a 45-meter diameter of the central dome to commemorate the year of independence. The massive mosque complex has only one minaret to represent the divine oneness of God, soaring at 66.66 meters tall to symbolize the 6,666 verses in the Quran. Awed visitors include Barack Obama, King Salman of Saudi Arabia, Angela Merkel, and many more world leaders. 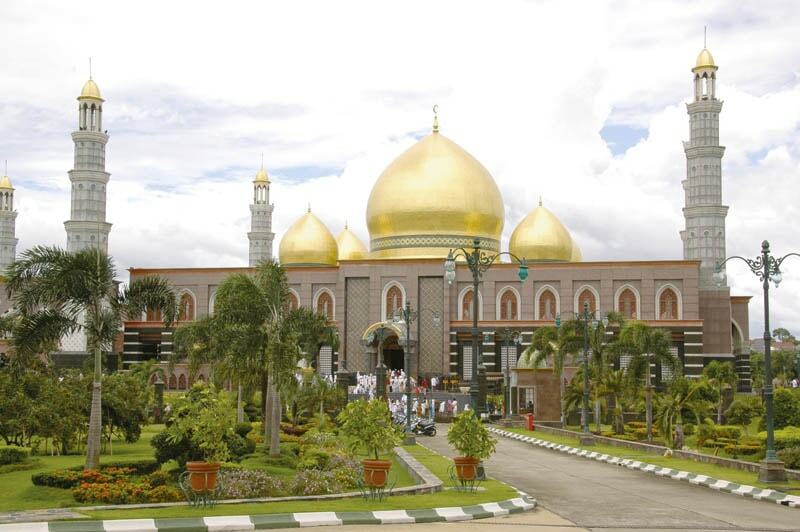 This mosque is also known as the Golden Dome Mosque, for obvious reasons. The five gold-coated domes are certainly hard to miss when admiring the architecture, which draws from Middle Eastern style with multiple minarets, domes, and Islamic decorative detail. The exquisite mosque was named after its benefactor, a businesswoman by the name Hj. Dian Djuriah Maimun Al Rashid. 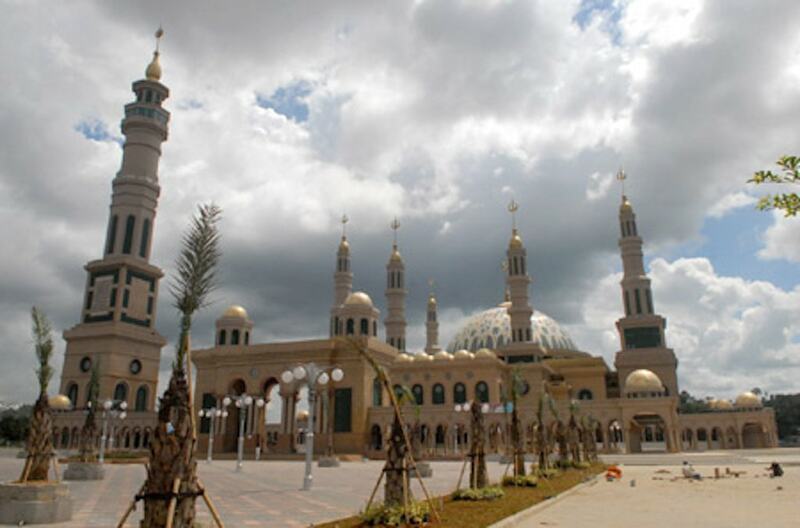 At 50 hectares, this is also one of Southeast Asia largest mosques. Unlike most other mosques in Indonesia (or anywhere else for that matter), Bayur Mosque combines Thailand’s pagoda-style architecture with influence from West Sumatra’s traditional houses with the three-tiered roof. Its architectural uniqueness is also made complete by authentic and sometimes fusion ornaments and also a beautifully-crafted landscape with fountains and fish ponds, adding tranquility to the earthy-toned mosque. 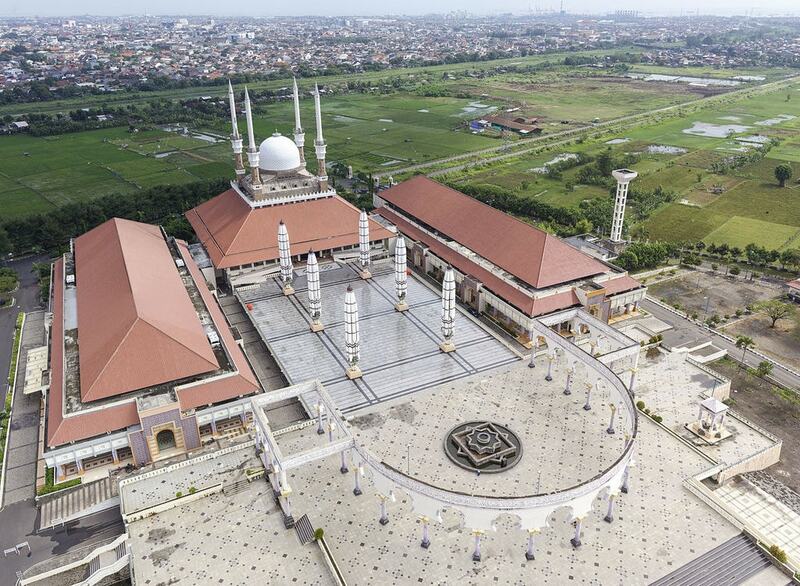 Also known as the Great Mosque of Surabaya, this is Indonesia’s third-largest mosque. It has 45 main entrances crafted from fine teak wood and a calming but cheerful blue-and-green leaflike dome on top of the two-storey broad building. From the 99-meter-tall tower, visitors and worshippers can enjoy a sweeping view of the city, along with Sidoarjo and Bangkalan, the two neighboring towns. 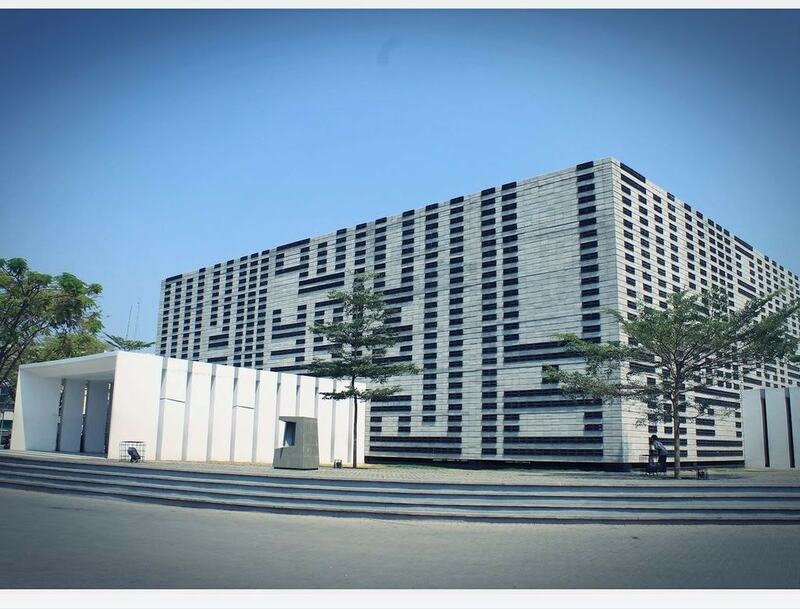 At a glance, this futuristic, minimalist cube may not exactly look like a common mosque. But with careful observation, you can spot Arabic sentences of adoration to Allah embedded in its exterior. Designed by a local architect who is also Bandung’s mayor Ridwan Kamil, the building employs an open landscape concept with closeness to nature and natural light. The award-winning design also includes symbols of Islam in its meticulous detail, such as 99 light bulbs for 99 names of Allah, each adorned with an individual name. Located on the banks of the great Mahakam river, this mosque has become an iconic landmark of Samarinda, East Kalimantan (Borneo). It is an impressive architectural masterpiece with seven towering minarets and a stunning main dome adorned with flowery patterns, inspired by Istanbul’s Haghia Sophia Mosque. Its ceramic floor bordered with granite lends a feeling of luxury to the interior. The vast mosque complex also makes quite a breathtaking sight when seen from the nearby Mahakam Bridge. 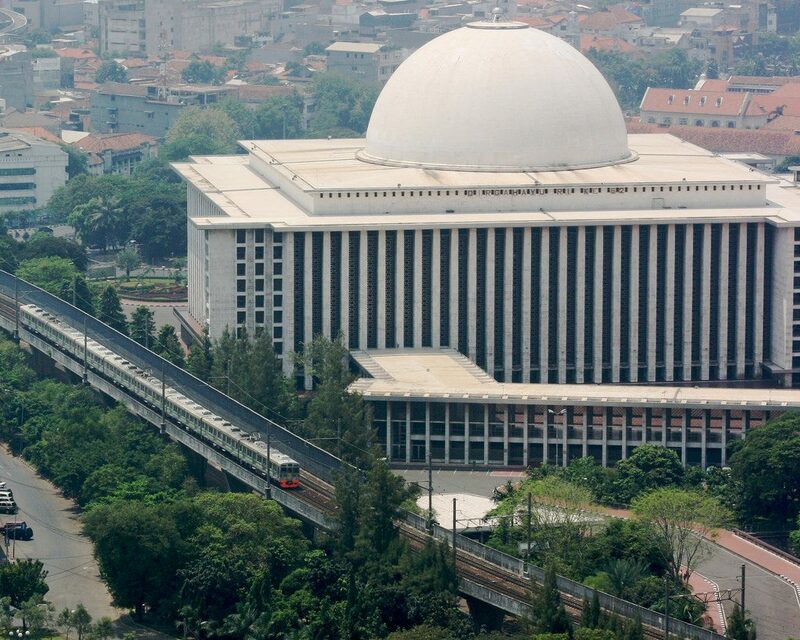 Established in 1949, this is one of the oldest mosques in modern Indonesia and certainly one of the most majestic. The grand structure combines Middle Eastern style with a Mediterranean touch. The grand façade assumes a calming pastel green tone, including its two tall minarets. This grand mosque holds a giant Al Quran that has been attracting tourists’ curiosity. It also has a library with an extensive religious collection. This mosque is an unmissable landmark in the middle of a humble village. It is said, the ten-storey mosque came as a surprise even to locals because they’d never noticed the construction until the building was standing tall and beautiful, leading locals to believe that spirits built the mosque. The massive building is very ornate with detailed patterns in every corner, dominated by blue and white tones. The complex includes an Islamic boarding school and many stunning areas — ponds, terrace, gazebo and more— that are open to the public. Located in Central Java’s capital Semarang, the mosque complex covers three central buildings in a U formation, creating a spacious courtyard with the mosque at one end. Incorporating Javanese design principles, the central roof resembles that of a local traditional house, but it also symbolizes steps toward God’s presence. The house of worship also serves as a tourist destination, with a museum, convention center, café and hotel within its complex. 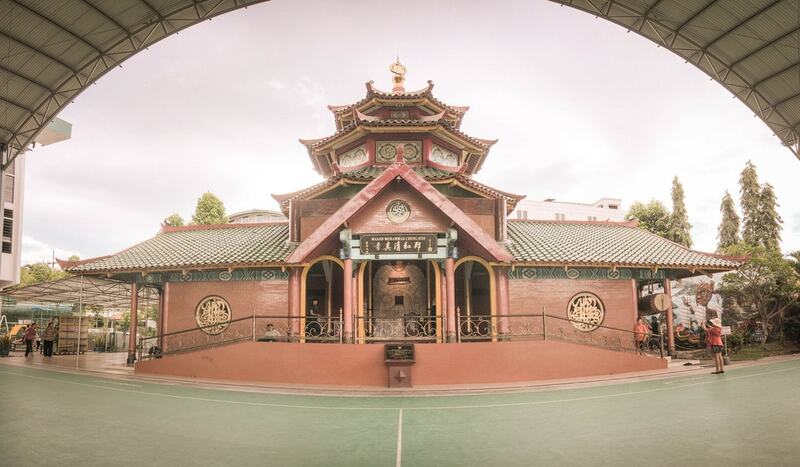 This historical house of worship is one of four mosques built to commemorate Chinese admiral Cheng Ho who visited different parts of Indonesia. Like the three other mosques, the architecture looks very oriental, with pagoda instead of a dome and a lot of Chinese detail. The architecture was inspired by Niu Jie Mosque in Beijing, but this mosque also incorporates local design as well as a Middle Eastern touch. With the Arabic script of ‘Allah’ alongside carvings of dragons, the unique fusion is what makes this mosque fascinating.